Need more pepperoni in your life? Check out these Pepperoni Bread Knots, Pepperoni Pizza Bites, and this One Pot Pepperoni Pizza Pasta! Dinnertime is always fun in the Gomez household. I feel lucky that the kids have my husband’s tastebuds and are willing to try just about anything, while I still slowly work on overcoming my aversion to things like mushrooms, custards, and puddings (it’s a texture thing, folks). This gives me a chance to experiment with foods and flavors without fear of the kids poo-pooing it right off the bat, which is such a relief to me and my wallet, ha! 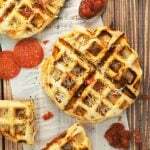 I knew, though, when I decided to combine the girls’ love for pizza and waffles into these super amazing Pepperoni Pizza Waffles, that I wouldn’t have any problems with the girls gobbling these right up. 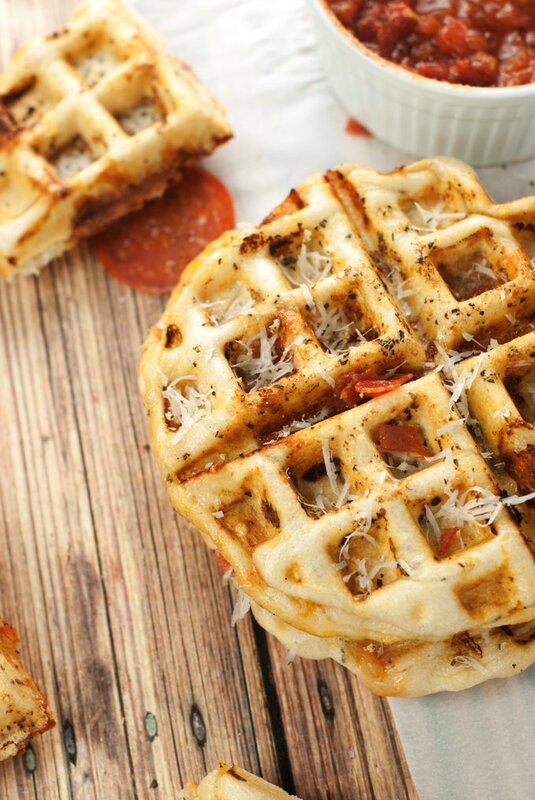 You gotta have some love for Hormel Pepperoni, they make these waffles super delish! 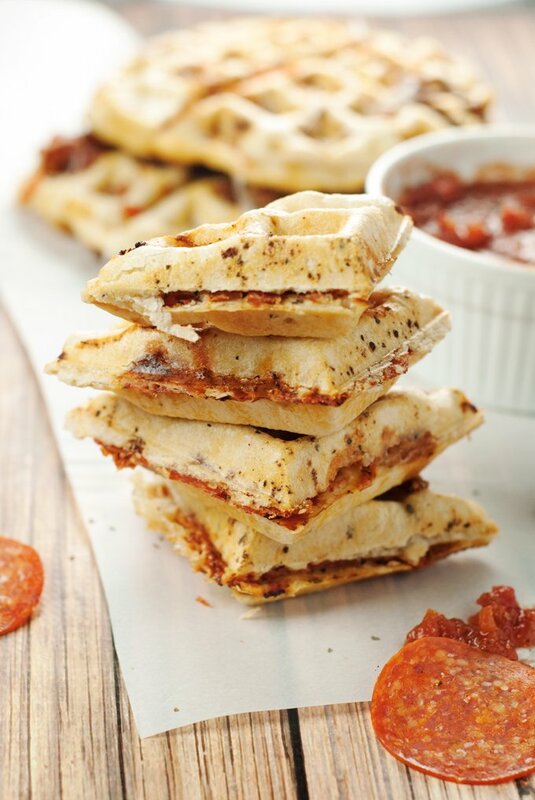 When I first thought about making waffles that weren’t exactly…waffles, I spent a lot of time struggling with the notion that I needed to make a waffle batter for the recipe to be a success, which was a total waste of time, because you can use pizza dough, no problem! 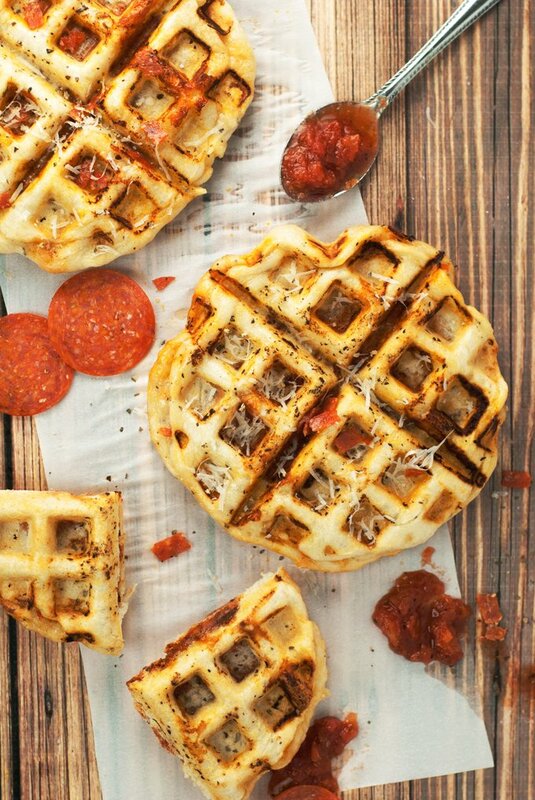 I took a very basic dough recipe and added some fun spices to give it a flavor boost, then stuffed it full of tomato sauce, Hormel Pepperoni, fresh mozzarella, and Parmesan cheese, then covered it with a sprinkling of extra spices and cheese before putting it in the best damn waffle iron to cook! This dinner can be on the table in less than an hour, the longest time being devoted to the dough rising, which, if you’re scared of a yeast dough, don’t be! 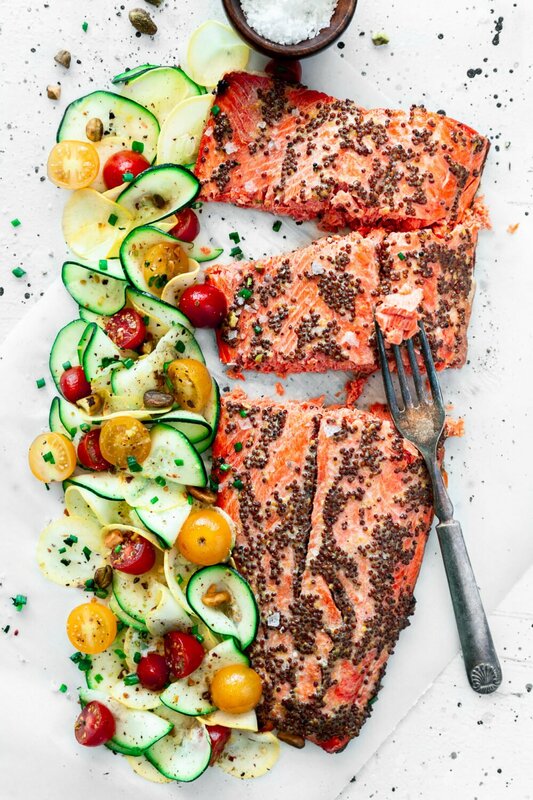 This recipe is so foolproof, you’ll feel like a pro when you’re done! 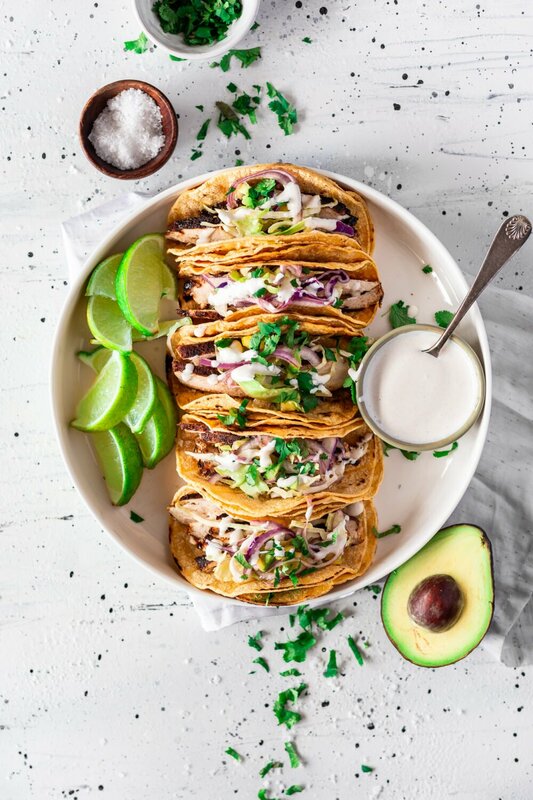 Get ready to make a meal your family is sure to enjoy! In a small bowl, add the warm water, then gently sprinkle the yeast over the top. Allow to sit for a few minutes, or until the yeast has dissolved into the water. In a large bowl, add the flour, then pour the yeast water over it. Using a spatula, mix the water and flour just until everything is wet, then add the olive oil and seasonings and continue to mix until a sticky ball forms. Turn the dough out onto a lightly floured surface and knead for a few minutes, adding a little flour as needed until the dough is no longer sticky, but not dry and cracking. Place the dough back in the bowl, cover with a damp cloth, and allow to sit in a warm spot to rise for 25 minutes. While the dough rises, place the tomatoes and seasoning in a food processor and pulse until smooth, then transfer to a bowl and set aside. Prep the remaining ingredients for the waffles. Once the dough is ready, cut it in half, then again, to create four balls. Cut each ball in half and stretch into round discs around 5 inches in diameter. Add a couple tablespoons of sauce and spread it around, leaving an inch around the edge clean. Add six pepperonis, followed by two slices of fresh mozzarella and a generous sprinkling of Parmesan. Cover with the second stretched piece of dough, pinch the edges together, then place in a waffle iron to cook, on high, for around 4 minutes. Serve with the remaining tomato sauce for dipping. 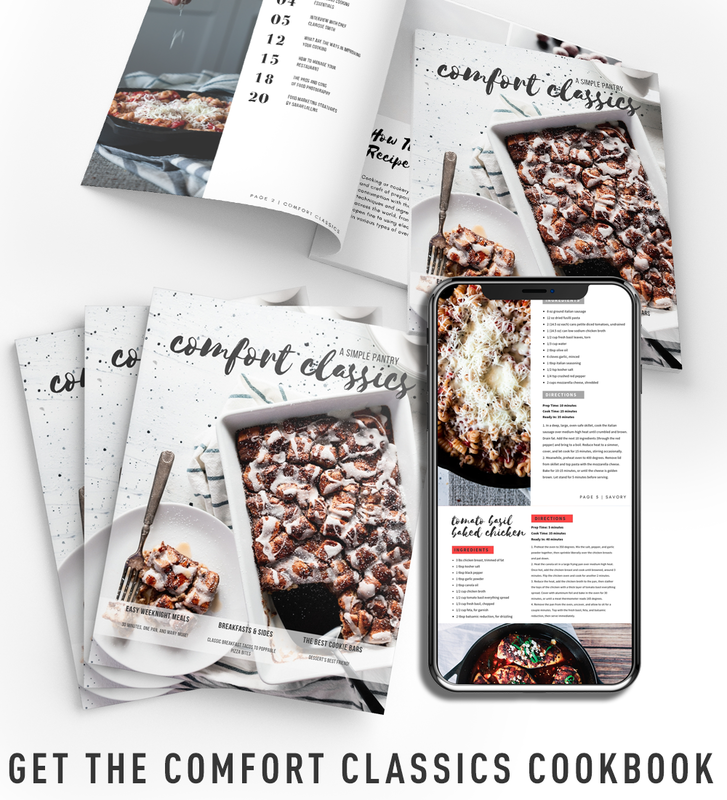 Looking for more recipes inspired by Hormel Pepperoni? Then check out these amazing Pepperoni Knots, or these Pepperoni Bites! 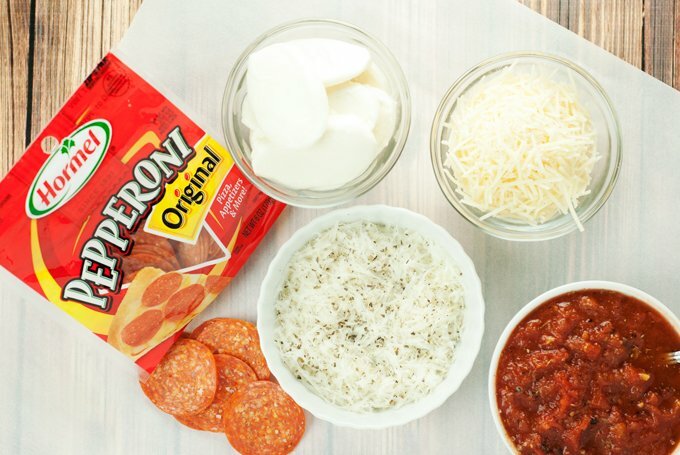 What kind of dish do you love to use Hormel Pepperoni in? Tell me in the comments! Yum! 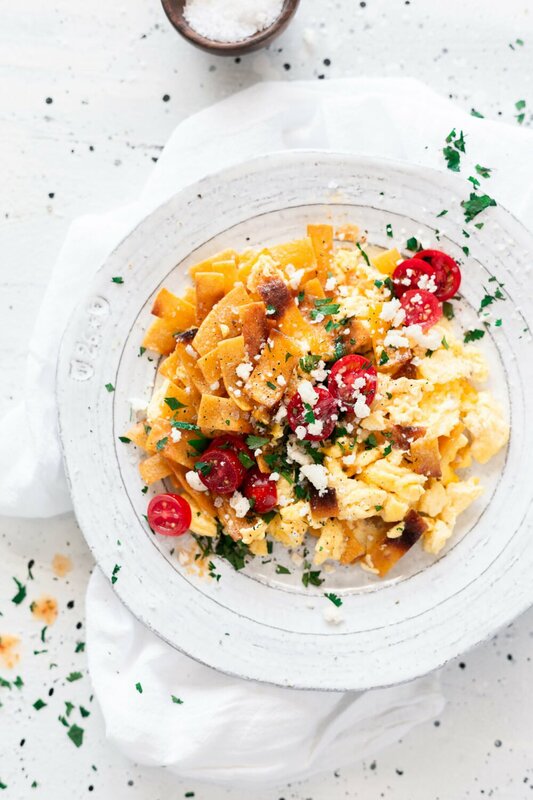 I am so making these for our next breakfast dinner!! This is so fun!!! 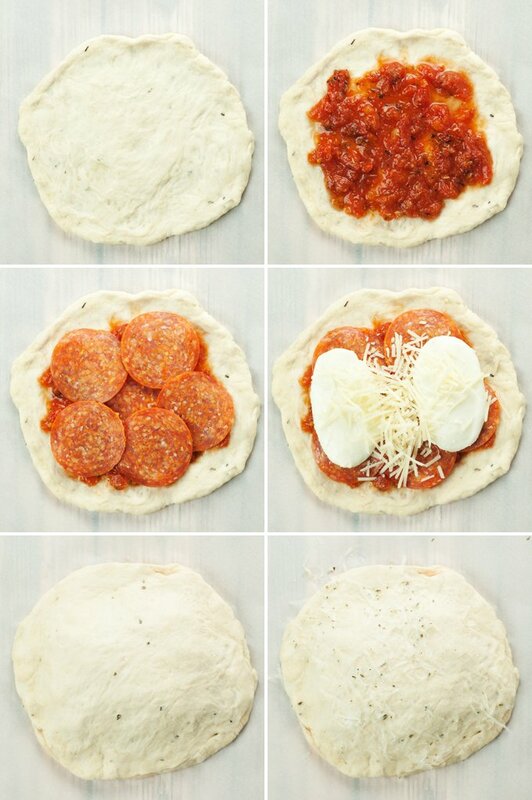 It would make a great lunch/dinner for my pizza loving family! 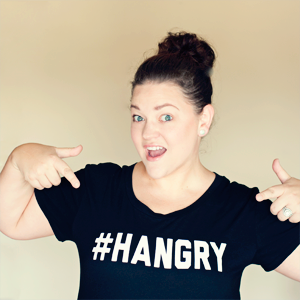 Wow - what an awesome idea Karly! My daughter would LOVE this! This makes dinner fun for sure! Glad to hear dinner always sounds fun at your house!! This looks so delicious! The perfect way to have pizza for breakfast. Genius idea! I need to make these! Pinning!!!! Love this idea. I probably have all the ingredients right now. I think I'll make it tomorrow night for dinner.! Oh my goodness ... this recipe is such a tease right now! I just said to my husband that I fancied a cheese and tomato toastie, but you can't imagine how much I wish I had one of these instead! Mmmm! This seriously looks amazing! I will be trying this one for sure! BTW I just tried to pin it, but it keeps taking me to a page with just the pic? Not sure why it didn't work! Thanks for the recipe, though! Hi Courtney! It might just be a temporary glitch, it did it to me a couple times before it worked as well! I usually pin from the bookmarklet instead! 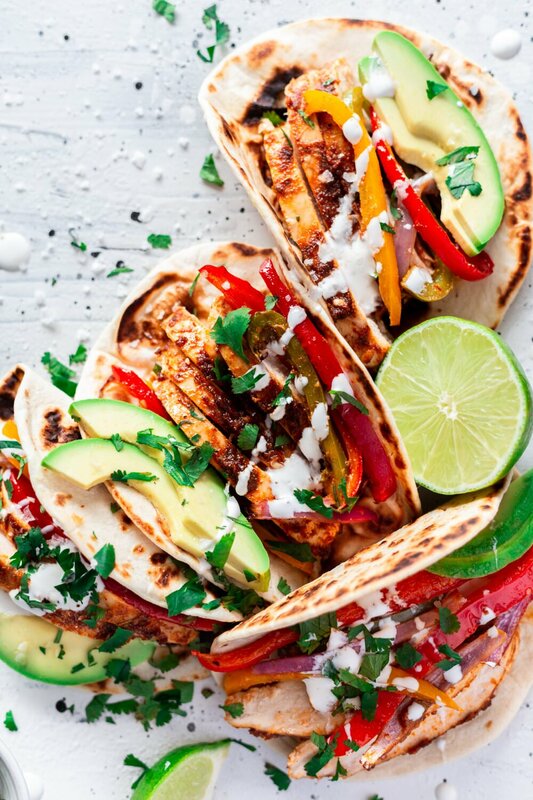 Holy cow, these look amazing! We just had homemade pizza last night, but this will have to be on the menu for next week! This recipe is awesome!! I can't wait to try it! Do you think regular refrigerated pizza dough would work?? Like Pillsbury? I'm not sure, but it's worth a try! Let me know if you do it! Good grief my mouth is watering! Thanks for sharing on Found & Foraged! 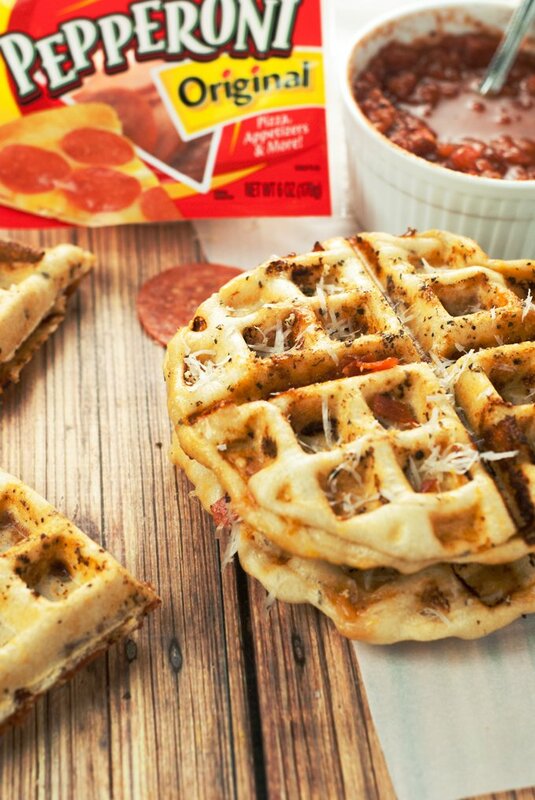 I don't think I've ever loved the idea of eating waffles...or pizzas as much as I do at this very instant. It is great to have a family who will eat anything - I'm rooting for you to get over your mushroom aversions...the world needs more mushroom lovers;) (whatever that means) Anyway...Thank you for linking up at #FoodieFriDIY this week! I am going to pin this, never thought to make pizzas in the waffle maker. Brilliant and I am sure my picky kids will love! What a fantastic idea. I never would have thought to put pizza dough in my waffle iron. Pinned! Trying this knowing realizing maybe you need a waffle maker that has a hinge that allows it to rise. My waffles are coming our wedged since the part to the rear gets more pressure. Thanks for sharing at the Inspiration Spotlight party! I would love to get a waffle iron & try this it looks amazing. You were one of the Inspiration Spotlight Shout outs Pinned & shared! Thanks for joining in the party and hope to see you again soon. Feel free to share this week too if you like. 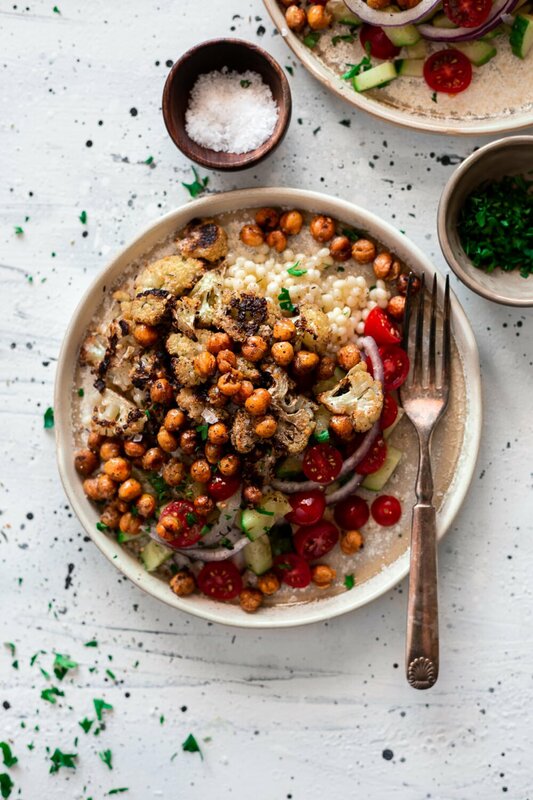 This is a great recipe it looks good???? WOW! We've tried tofu waffles and falafel waffles (and of course regular waffles) but you just totally blew my mind. Can't wait to try this!